TOKYO, Mar, 28 2019 - (JCN Newswire) - Mitsubishi Motors Corporation (MMC) announced that Mitsubishi Motors Krama Yudha Sales Indonesia (MMKSI), authorized distributor of passenger car and light commercial vehicle with MMC in Indonesia, and Garuda Indonesia announced continued to roll. This time the livery of the Mitsubishi Motors' logo and the "Drive your Ambition" tagline in the A330 aircraft with PK-GPY registration that will be operated in the limited time and was also operated Jakarta - Nagoya Inaugural flight on 23 March, 2019. 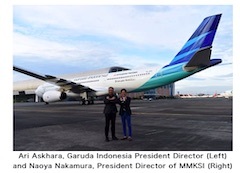 Naoya Nakamura, president director of MMKSI said: "I am happy and proud that Mitsubishi Motors in Indonesia, represented by MMKSI, can work together very well with Garuda Indonesia, by cooperating in many projects, for domestic and even international scale. Both companies are representatives of leading entities for goods and services, who have agreed to continue to explore new ideas and breakthroughs in terms of branding and also development in presenting the best service and highest satisfaction to customers." Synergy and branding cooperation between companies was conducted with considering the similarities of characteristics between Mitsubishi Motors and Garuda Indonesia brand, which were customer's the top of for ideal transportation options that offer prestige, comfort, features and excellent services at competitive prices for customers. Previously, the cooperation between MMKSI and Garuda Indonesia had been conducted with the installation of the Mitsubishi XPANDER livery on the B737-800 NG fleet with PK-GNU registration numbers operating for Jakarta - Denpasar route. Not only that, MMKSI also successfully cooperated in providing operational vehicle units for Garuda Indonesia flight crew. A total of 401 XPANDER units of the GLS MT variant with decal branding have been delivered as operational vehicles and the official unit shuttle transportation for Garuda Indonesia cabin crew. 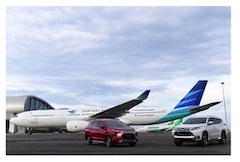 Aerotrans - a part of Garuda Indonesia Group - has purchaced XPANDER vehicles as crew operational vehicles and is gradually planning to increase this collaboration with Mitsubishi Motors in the future, with the addition of fleets and other branding programs. Presenting a new level of service excellence in air travel, Garuda Indonesia, the national airline of Indonesia, seamlessly connects 83 destinations worldwide, including exotic locations across the beautiful archipelago of Indonesia. With more than 600 daily flights and a fleet of 196 aircrafts by January 2017, Garuda Indonesia proudly serves its passengers with the award-winning distinct service "Garuda Indonesia Experience", highlighting Indonesia&apos;s warm hospitality and rich diverse culture. To provide better and more convenient services, Garuda Indonesia continuously strives through its ongoing transformation program. The progress of the transformation can be seen from the achievement of a Skytrax&apos;s 5-star Airline rating as well as the winning of the prestigious "The World&apos;s Best Cabin Crew" for four consecutive years in 2014 to 2017 and "The World&apos;s Most Loved Airline 2016", also from Skytrax. Please visit www.garuda-indonesia.com.